These are kind of a modern application to stenciling and mixed media I suppose, but what I love about experimenting with stencils is that it all works. It never has to be done a certain way and everyone gets to add their own twist to their project. I want to show you how easy these were to make but remember, you can change it up and make it your way if you want. I generally like to choose three colors when creating cards though I may incorporate several different shades of those colors to add depth. I picked red, pink and green and added black and white to the mix (non-colors). 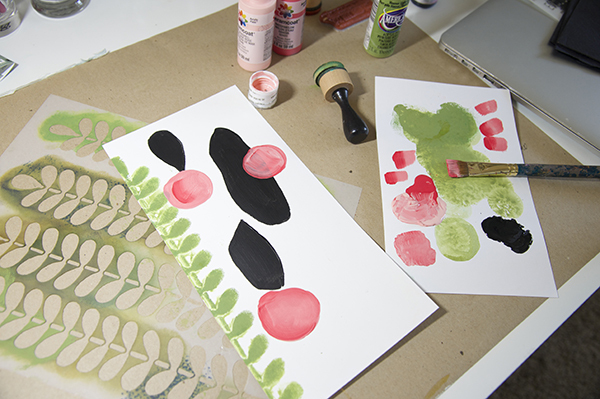 Begin by applying gesso to the substrate and when dry, pull those stencils out! (All stencils and supplies are listed at the bottom of this post). 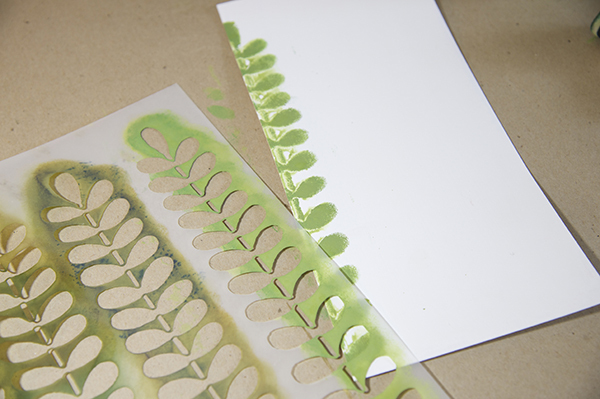 For this project, use the Straight Stems stencil with green acrylic paint and apply it randomly in three different places. When those dry, come back in and form odd shaped circles from light and dark pink acrylic colors. After that, it’s all fill in work. Tulip-like flowers, polka dots, random repetition markings, cross stitches and heart stencils are all perfect. 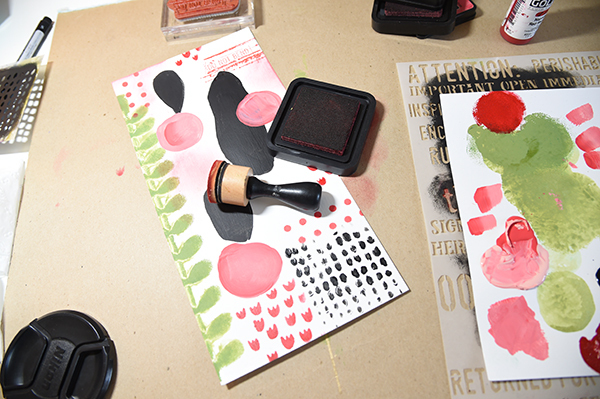 I also had to try Seth Apter’s new stamp design because I love anything postage. It fit right into this piece. 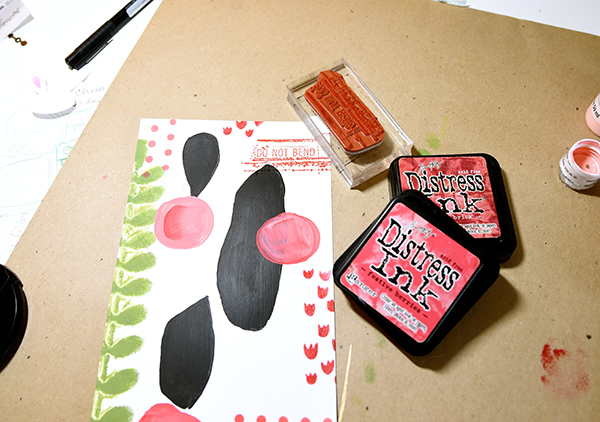 Use distress ink and a blending tool to add a little bit of color to the background. Add sentiments over the top of everything to fill it all up. Lastly, add markings with black and white pens. A gold pen here and there looks amazing! To me, these tiny details are the best part. It’s like decorating the cake. Those details do make a difference. I was left with a nice piece of patterned paper, so to speak. Now it’s time to cut it all apart. All my card bases are 4 ¼” x 5 ½”. To build this card (this was personally my favorite one), hand-cut two hearts from the patterned paper. One is larger than the other so they can be layered together using foam dots. Before placing them on the watercolor paper card base, do some random water coloring and flick some of the paint onto the substrate. Once the paint dries, the Urban Insiders Circles stencil gets applied using gold Finetec watercolors and your finger or a brush. (Btw, those paints are amazing!). Hard to see here but add arrows to the base with a gold pen and then use a black pen to draw the “X’s” and “O’s” using the Cross Stitch stencil. Now add your hearts. 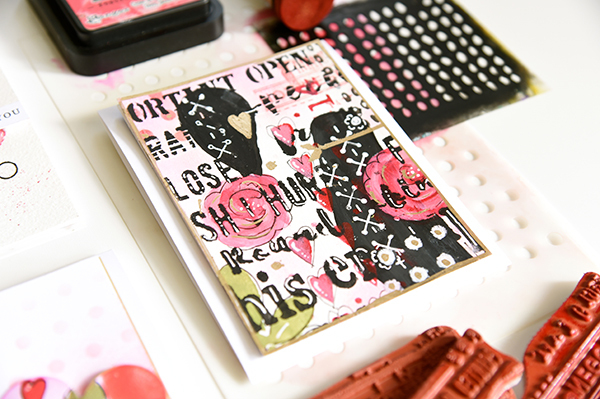 Stamp a sentiment in black ink, adhere it to the card and you're finished! This second card was by far the easiest because the work had already been done. Cut the stenciled paper down so it is slightly smaller than the card base, embellish the edge with a gold marker and adhere it to a mat board cut the same size. Attach both to the card. 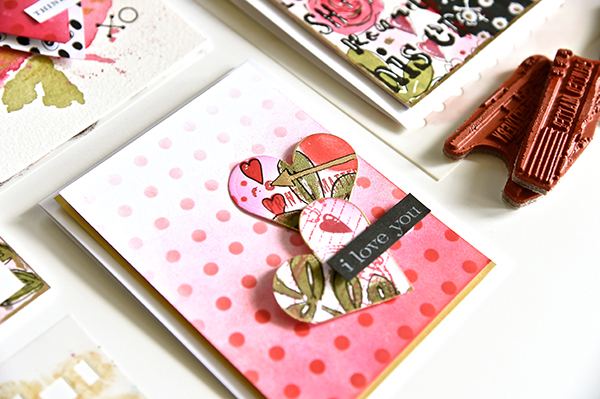 *TIP: My rule of thumb for card making is to have a background, a main focal point and a sentiment. This piece had it all. There’s something to be said about threes in art. And how simple is this card? Let me tell you how easy! Adhere the patterned paper onto the card base. 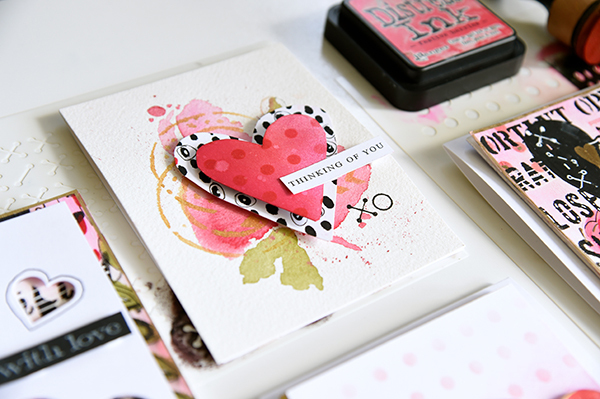 Cut a white cardstock mat slightly smaller than the card base and cut out heart shapes. You can use die cuts or you can use an exact-o knife. Either one works. Doodle around the hearts if you like then use foam dots to attach the cut out piece to the base. Stamp a sentiment using white ink onto black cardstock and adhere in place. For the last card, cut a mat slightly smaller than the card base from white cardstock. 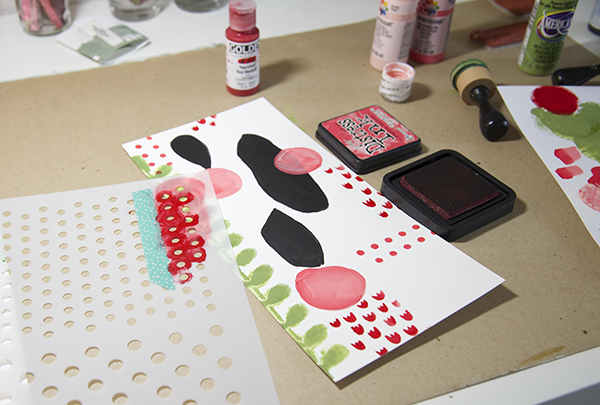 Use distress ink and a blending tool to add polka dots to the mat. Create an “ombre” look by adding lots of ink to the bottom of the dotted stencil and gradually go lighter when progressing to the top. Remove stencil and starting at the bottom again, add color onto the whole mat substrate using a blending tool and ink, heavy on the bottom, getting lighter in application when approaching the top of mat. Cut a gold piece of paper slightly larger than the mat and adhere to card base. Adhere dotted cardstock to gold paper. 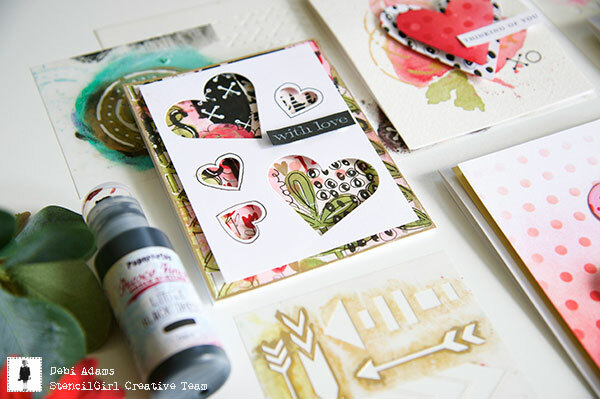 Cut two hearts from the patterned paper and embellish the edges with a gold pen. Adhere hearts to mat base with adhesive and foam dots. Stamp sentiment with white ink onto black strip of paper and adhere in place. Well there you have it. Like I said, I think it’s a modern twist on stencils but oh so easy. I would love to do this same idea but with grunge, rust and patina! Ahh! Art. It’s always fun to play. Thanks for hanging with me today. Easy but very effective results! I love these cards - thanks for the timely inspiration! Somehow you have made these very detailed mixed media cards modern, graphic and clean. Yes! Thanks Seth. I like a challenge. Better yet, everyone can do this and all are invited. Thank you Amy. So glad you like them! I don't always like some of the stenciled projects that I've seen, but I love these. I love the backgrounds that you made. 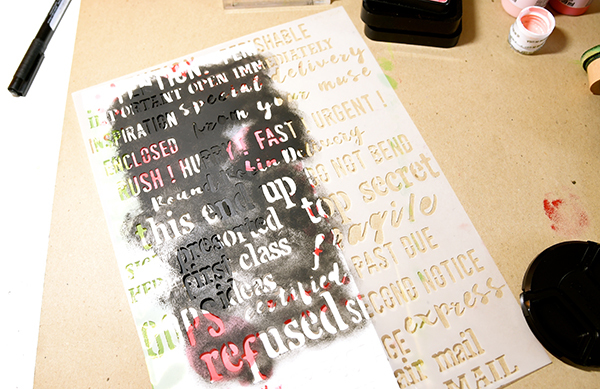 I usually just do cards, so I am very glad to see the stencils used in card making. Thank you Annette for your kind comment.❤️ I know everyone has different styles and tastes so I’m glad that at StencilGirl we get to bring all of it to the creative table. Though I make all kinds of projects, my daytime job involves cardmaking so I thought why not do some here. Love these cards! Thanks for the inspiration! 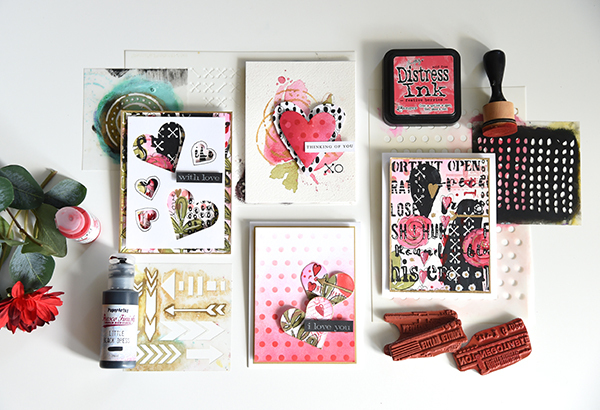 I love the background paper and then being able to use it in different ways on the cards.